GREENGUARD Gold certified. Fixed shelving provides plenty of space for books, puzzles & more. 100% Plywood with mortise & secure fastener construction for exceptional strength and durability. UV Finish provides unsurpassed protection and beauty. Lifetime warranty and MADE IN THE USA. Unassembled or Assembled options available. 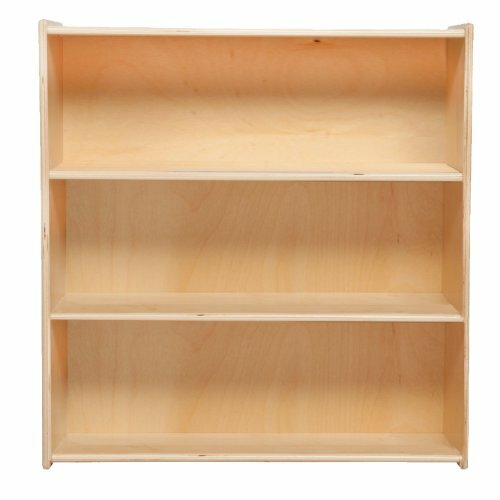 33-7/8"H x 30"W x 12"D.
Fixed shelving, Fully assembled. All surfaces and back are constructed entirely from Healthy Kids plywood. Promotes a healthier early learning environment. Does not emit any harmful contaminants (VOCs) into atmosphere. Manufacturers Lifetime Warranty. 5/8" Thick Solid 11 ply Baltic Birch Plywood Healthy Kids. Counry of origin: United States. Product Dimensions: 33.875"Hx30"Wx12"D. Product Weight: 42 lbs.